Shown on Nick Jr, Ben and Holly's Little Kingdom is an award winning children's show featuring the two main characters of Ben the Elf and Holly the Princess. Ben and Holly get up to all sorts of adventures in their world that includes The Meadow, Frog Pond, Little Castle and Gaston's Cave. Ben loves jumping, running and lifting things, whilst Holly is a little princess who lives with her father and mother - King Thistle and Queen Thistle. Daisy and Polly are Holly’s twin sisters who are still learning to read and fly using their little wings. Ben lives with Mr and Mrs Elf who employ a very wise old elf to teach Ben as well as looking after the Elf factory in the woods. Golden Bear was the manufacturer of Ben and Holly's Little Kingdom soft toys that not only included the main characters of Ben and Holly but also various playsets including Ben and Holly's Castle and Gaston's Cave. All of these toys helped little fans of the show to recreate their favourite scenes. Following a new look to the TV show in 2013, Golden Bear created some amazing new Ben and Holly toys for little girls aged 3-6 years old. Featuring the three fairies Violet, Holly and Fleur, the plastic figurines and plush toys are all sparkly and pink for maximum girl appeal. A new playset called Princess Holly's Magical School Days is also launched which ties in with the Magic School online games. 2014 saw the Ben and Holly’s Little Kingdom licence transfer to Character Options. This change in supplier brought a whole new range of toys to all of the shows junior fans. 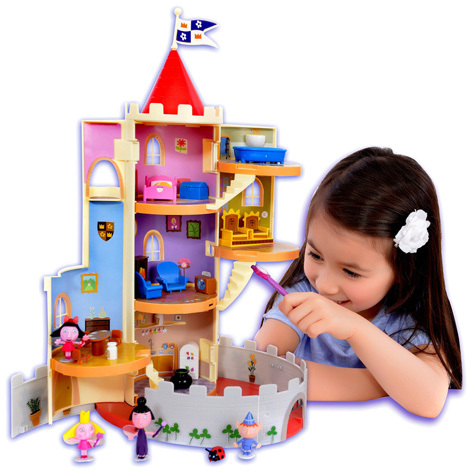 Hero products included a brand new Thistle Castle Playset supplied with many different accessories. Other featured toys include a Hide and Seek Holly that comes complete with a magic wand. Magical Playground Playsets and an Adorable Talking Plush Holly were added to other toys such as the Bump and Go Gaston Ladybird as well as plush toys of all the favourite characters. Another top toy company, HTI, is licensed to make a series of Ben and Holly role-play toys. With their expertise in this category, the Tea Pot set, Princess Holly Dressing Table and a range of dolls prams are sure-fire hits with fans of the show. Popular wheeled toy manufacturer MV Sports makes a large selection of Ben and Holly endorsed scooters, bikes and ride-ons together with accessories such as helmets. These are joined by a special Magical Lights and Sounds Tri-Scooter with a selection of incredible working features.